Both my kids were born at Marin General Hospital in Greenbrae and subsequently had many checkups at the nearby pediatrician's offices, so we've been fans of Creekside Park, located right across from the hospital on Bon Air Road, for a long time. 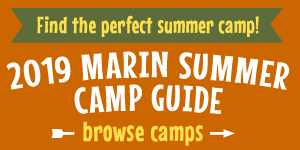 This large community park (26 acres) is one of our all-time favorite playgrounds in Marin. If you haven't been, this is definitely worth a visit. With an incomparable setting along Corte Madera Creek, two exciting playgrounds, and quite possibly the best views of Mount Tam in Marin, there's really something here for the whole family. Hal Brown Park at Creekside features large expanses of lawn, great for games and even just running around. Further on, you'll find two playgrounds: one for toddlers and preschool age children (2–5) and one for older kids (5–12), both of which are really well designed, clean, and, above all, fun. The playgrounds both have a naturalistic design that really harmonizes with the park's setting. The preschool and toddler area has a few cool features that you don't find at just any old playground. A large shade structure helps keep the sun off little ones' skin and keeps things cool as they tool around on the unique tricycle track, complete with street signs. Other features include a sandbox and water play area, spinning bowls (watch out—they can get really get moving! ), toddler swings, and larger-than-life sculptures of ducks and wildlife nests that pay homage to the surrounding marshland. The adjacent playground is designed for more adventurous older kids. It features an awesome 17-foot-tall climbing net, a climbing wall, and creek-like sand and water play area, a covered curving "turbo slide", and a small overlook for wildlife-watching. The tall red climbing net structure was really the hit of the park for my kids. Climbing to the top feels like a real accomplishment, and there are swings and sitting platforms attached added fun. You can spend the whole day playing at Hal Brown Park at Creekside. Pack up your folding chairs, balls, sand toys, and even a picnic. Don't forget the binoculars to look for birds and other wildlife in the creek and marsh area. Don't miss the health and wellness grove near the park entrance. It's landscaped with plants that all have healing or medicinal properties—it's fitting, given the park's location near Marin General and the Eliseo Drive medical offices. Organized sports games are not allowed on the lawn areas—they're for informal play and relaxation only. On-leash dogs are allowed, but make sure they don't enter the sensitive wildlife areas bordering the park. Most areas of the park, including the playgrounds, restrooms, and overlook, are accessible. To get there, take Highway 101 to Sir Francis Drake Boulevard in Greenbrae. Head west on Sir Francis Drake Boulevard and turn left onto Bon Air Road. Hal Brown Park will be on the right, directly across from Marin General Hospital. Parking is available along the street. The Corte Madera Creek Path is adjacent to the park. It's perfect for bike-riding, walking, and bird-watching, although as of this writing in September, 2011, the path is closed in this area for construction work.